Norway - Samlerhuset Group B.V.
Samlerhuset Norge AS is the mother company of the Samlerhuset Group. 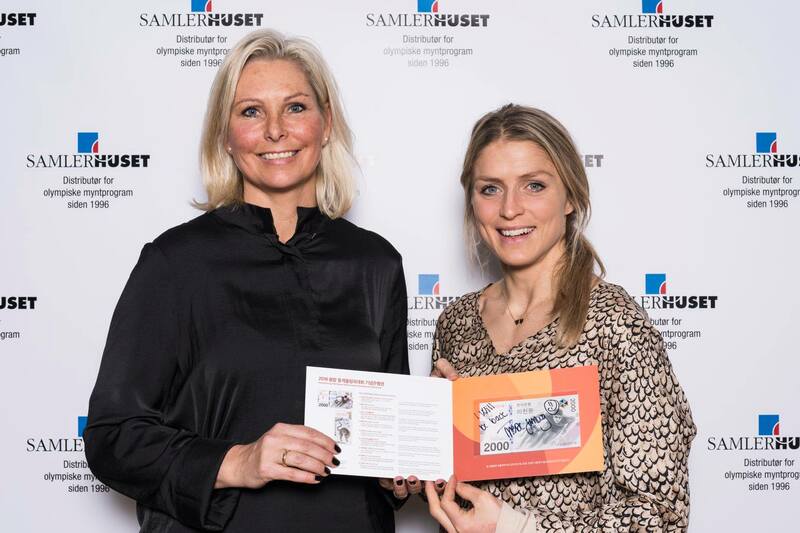 The Norwegian cross country skier and Olympic Gold medalist Therese Johaug withe Samlerhuset’s CEO Vibece Furseth. In 1994, Ole Bjørn Fausa, Reidar Nilsen, Helge Hellebust and Sigmund Jacobsen established Samlerhuset. Samlerhuset was mainly about coins, medals and stamps, as is visible in their square-and-circle-logo. Samlerhuset has since moved their focus more towards coins and medals. Still, stamps are still very much part of our products. For Samlerhuset, numismatics and history play an important part of our DNA. Therefore we cooperate with some of the leading experts in Norway in both fields, from the University of Oslo and University of Stavanger. We have taken an active role in Norwegian numismatic societies, listening to their feedback and needs to be at our best. 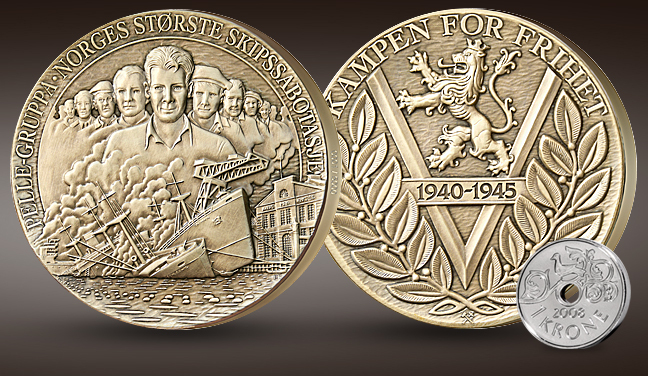 This art medal was produced by the Mint of Norway and distributed by Samlerhuset to honor the resistance heroes. Samlerhuset also honored Pelle-gruppa on this medal with their own monument. Samlerhuset is among the top distributors of Norwegian coins. We offer all coins struck in Norway on the open market. In addition, Samlerhuset sells international coins from 600 BC. Samlerhuset also distributes medals and other products made by The Mint of Norway or other mints. This includes medal sets honoring the Resistance Heroes of Norway, Norwegian art, Norwegian cultural and scenic sights, the history of Norway and a number of other themes. Samlerhuset started out with stamps, and we still have a large variety of Norwegian stamps from 1855 up to today. Brussels Hoard:, February 2004: Samlerhuset, in cooperation with the Ashmolean Museum in Oxford, had this famous treasure on display in 2004 with scientific publications written by professor Nicholas Mayhew at the Oxford University and associate professor Svein Gullbekk at the University of Oslo. World’s biggest gold coin March 2009: The biggest gold coin, form Perth Mint, was on display on Grand Hotel in Oslo. The Double Eagle coin from 1933, March 2012: A Double Eagle (a golden $20 coin) from 1933, has been considered the most expensive gold coin in the world. Samlerhuset financed the exposition in Oslo. «Flowing Hair Dollar»/The US Declaration of Independence, March 2016: The «Flowing Hair Dollar», and one of the earliest copies of the US Declaration of Independence were both on loan from the Smithsonian Institution. Max Manus statue, 7. June 2011: Samlerhuset financed a statue of Max Manus, one of the most famous resistance heroes of Norway. Pelle Group Monument, November 2014: The Pelle Group was a largely forgotten group of resistance heroes as their leader was associated with communism. Samlerhuset played an important role in making the monument come to fruition. Merchant Navy Register, January 2016: The Merchant Navy has been Norway’s guilty conscience for a long time. In 2011, this started to change, partly thanks to the author Jon Michelet. Together with Michelet, Samlerhuset took the initiative and initial financing to create a register for all merchant seamen who contributed to the War Effort during World War 2. These men and women often risked their lives in inhuman conditions to deliver goods and weapons to soldiers. The Rollo project, January 2016: Samlerhuset helped finance and participate in a project to find out about Rollo/Gange-Rolv. Rollo was the viking duke of Normandy, and the great-great-great-grandfather of William the Conqueror. Findings in Hafrsfjord, 2017- : Samlerhuset is among the sponsors of Funn i Hafrsfjord (Findings in Hafrsfjord), who are studying the bottom of the fjord where the Battle of Norway took place. According to legend, this was where Harald Fairhair defeated his biggest enemies and united Norway. Proof is lacking, but the seabed is excellent for preserving viking material. The game, as they say, is on.